Posted on December 14, 2011 at 4:42:23 am by Lauren C.
While some cities have Chinatowns, Fort Wayne has a "Burmatown" of sorts. Burma, officially known as the Republic of the Union of Myanmar, is a country in Southeast Asia. The first Burmese immigrants came to Fort Wayne in the early 1990s to escape political turmoil. Since then, the Summit City has become home to approximately 5,000 Burmese, the largest group in the country. These refugees have made significant contributions to Fort Wayne&apos;s cultural patchwork. Here are just a few opportunities to learn more about their culture: Food: Just south of downtown, Mahnin Asian Restaurant, 2701 S. Calhoun St., is a great way to experience authentic Burmese cuisine. The storefront is rather unassuming, but the food is rather tasty (and spicy of course.) All meals are artfully prepared, served with a tiny bowl of spiced chicken broth and a dessert of fresh fruit cut and arranged in a design.The best part: most dishes are under $5! If you prefer to try your hand at Burmese cuisine at home, stop by the Asian Market Inc. Not far from Mahnin at 2615 S. Calhoun St., this grocery has an assortment of Asian ingredients and spices not commonly found in conventional stores. Check out their selection of fresh vegetables and meats! 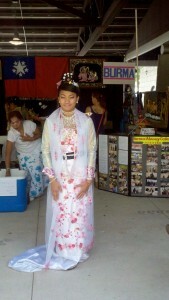 Culture: There are several events year-round designed to showcase Burmese dance and art. Most recently, the International Village was a two-day mini-festival in July organized to bring together different cultures and ethnic backgrounds (including Burmese), all living in Fort Wayne. The idea was that food, music and cultural dances, along with musical performances and demonstrations, will foster a greater understanding. Visit the Burmese Advocacy Center&apos;s web site to keep posted on upcoming events.